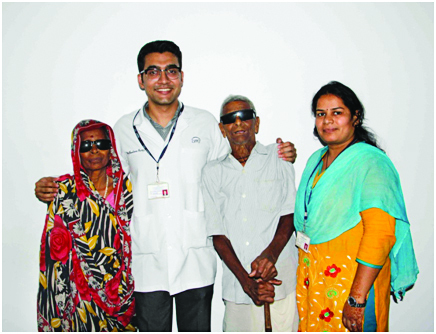 Bhikari Nayak, 90, and his wife Sasi Nayak, 70, from Dulanapur, Banki, Odisha were treated at Shri Mithu Tulsi Chanrai Campus in Bhubaneswar for cataract. When they did not turn up for their post operation check-up, a concerned Dr Nadim Kazi informed Kirteemayee Roul from the patient care team. With no contact phone number or detail mentioned except their village in the patient record, Kirteemayee requested another old patient from the same village to inquire about the couple. 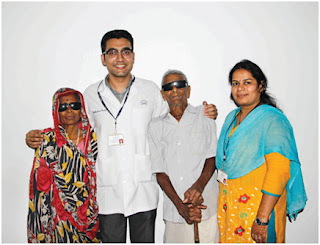 The patient got back to say that the couple lived in abject poverty, and could not afford their prescribed eye drops leave alone travel to the institute for their check-up. Dr Kazi and Antaryami Muduli from the nursing team went to their house and escorted them back to the campus. In absence of proper care, Sasi's eyes had developed mild edema and congestion. Medical treatment was begun immediately and a second surgery performed. On the day of discharge, Dr Kazi gave them Rs 500 from his pocket and asked them to come for their follow-up without fail. The institute applauds the dedication of the team that went beyond their call of duty.